Action! It’s the most powerful word in the English language. Planning is important; positive belief is critical; preparation makes a difference. But, without the follow-through principle of action, nothing happens — nothing!! This concept is simple, but sometimes, not so easy to implement. Have you ever had a time in your life when you just couldn’t get motivated? You knew what you wanted to do, you had the desire, but you just couldn’t motivate yourself to take the first step. When your get-up-and-go has gone and you find it difficult to get motivated to take action, consider this — you may be going about it all wrong. Experts in the field of human motivation tell us that instead of waiting until we are motivated to take action, we need to reverse the process and take action to get motivated. Nothing makes us feel enthusiastic like acting enthusiastic. Nothing inspires creativity like getting started on a new project. Nothing gives us the energy to move ahead like taking that first step, and then the next. Your emotions take their clues from your actions, not the other way around. Many lack motivation because of fear: fear of failure, fear of rejection, fear of too much success, fear of what others might think, fear, fear, fear. It can leave us paralyzed and ineffective. What is the cure for fear? ACTION! If you are afraid of rejection, contact more people. If you fear ridicule, make your presentation dynamic and audacious. If you worry about failure, take action that will move you toward success. The truth is, most of the things we worry about never come to pass. So why worry? Instead, take decisive action to cure your worry and overcome fear! So, next time you just don’t feel like it, do it anyway. Few things are as bad as we imagine they will be if we will simply jump in with both feet, pretending that we can’t wait to get started. Pretty soon you will feel like it. Shakespeare said it like this, “assume a virtue if you have it not.” In other words, if you want to be happy, try acting happy. If you need energy, act as if you have barrels full! 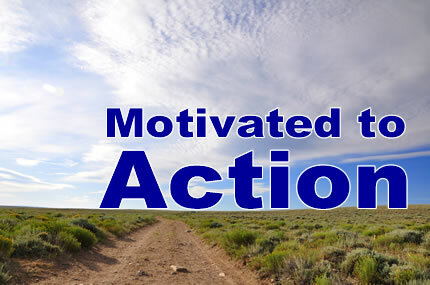 If you want to feel motivated, take motivated action. Ham it up! Make it fun. Without a doubt, your feelings will follow your actions and pretty soon your actions will help you feel truly motivated. Try it! Motivation is over-rated. Just make a plan and stick with it. Eventually, the gift of neuroplasticity will take over. Thanks for the post. Wow this information is great! Thanks, this has helped me a lot! I have been monitoring MindPerk, being a lurker for some time now. I elected that I will get involved and communicate with the users here. I’m hoping to meet plenty of stimulating people and learn some outstanding stuff. Excellent. Simple but gives so much motivation to act. Great and true comments. Always good to be reminded. Absolutely right; the message couldn’t be simpler and more true. Thanks!! Great reminder to Just Do It. Previous post: Consumer Confidence Will Be Restored When Abilities Are!